What’s really happening at Fukushima? RT: An estimated 300 tonnes of contaminated water is spilling daily into the ocean. How come Tepco insists the leaks still pose no big threat to the environment? HW: They are lying; they can’t face the reality of this situation. When have very serious quantities of radiation going into the Pacific Ocean. There is no medical or epidemiological or scientific basis for estimating how much damage this will cost. We are on entirely new ground here and this cannot go by without a serious impact on the entire human race. This is a terrible tragedy. The problem is that the company does not want to admit how serious this is and the government of Japan doesn’t want to admit how serious this is. And even if the government of Japan steps in, they don’t know what to do. This particular administration in Japan wants to open the other nuclear plants. 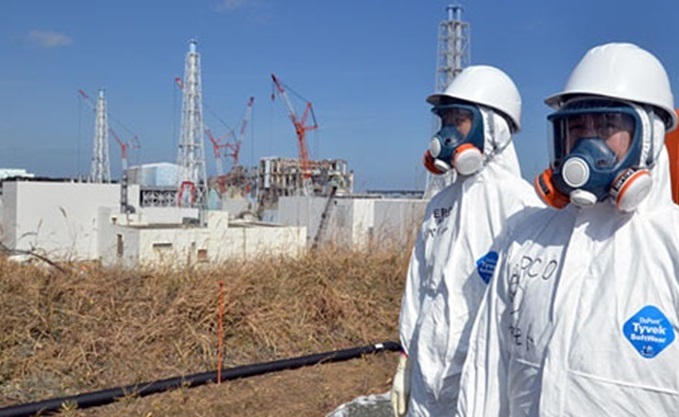 50 nuclear plants have been shut in Japan since the accident and they want to reopen them. RT: According to some estimates it will take 40 years to clean-up the contaminated area. Why so long? HW: That is not long enough. It will never be cleaned up. We have materials there that are radioactive, that are harmful, and that are dangerous for hundreds of thousands of years. They can talk about cleaning it up in 40 years but it will never be cleaned up. You will never be able to go back on that site. The radioactivity will be in the waters forever. RT: What long-term impact of the radiation leak on Japan and its neighboring countries we should expect in the future? HW: There are serious health impacts. People will be harmed. We are seeing 40% rate of thyroid damage among children in the area and this is a huge impact and it will go up, not down. More and more radiation is escaping from the water and tritium into the atmosphere. And radiation to the thyroid is very serious, especially among small children and we are already seeing a 40% rate. People will be suffering for hundreds of years. I interviewed people in central Pennsylvania a year after the (3 Mile Island) accident and discovered tremendous health impacts among the people there. We know that Chernobyl did tremendous damage to people in Belarus and Ukraine and now we are going to see it again in Fukushima. Full article by RT…Water leaks at Fukushima could contaminate entire Pacific Ocean. Yes it is alarming. But to me that’s okay, actually important. Right now society slumbers as to what’s truly taking place. And even spiritual communities are only partially seeing through the veils. We are in the throws of wholesale change and it is going to get much more challenging and catastrophic before it gets better. It actually needs to. Can you stop for a moment and possibly imagine just how out of kilter life here in society really is: where we get our food from, how we live, the gadgets we use daily and of course the energy we consume. But it’s not just about trying to develop so called ‘clean’ or ‘free’ energy. The point is our very accepted and ‘normal’ way of living in society has become a rabid cancer that is devouring sentient life across the surface of the globe. It needs to stop. It will stop, even if humanity doesn’t do it by itself. To me, that’s the Fukushima message that Gaia has given us in no uncertainty. The powers that be either don’t know the extent of what’s going on or if they do, don’t appear to fully care. It’s because there’s an underlying alien agenda simply to exploit the Earth’s natural resources in order to perpetuate the status quo. We need to expand our horizons interdimensionally. This is not just a surface level conspiracy. It is no less than a full scale attempt at take over and colonization by an Opposing Consciousness, working behind the scenes pulling the strings of power. Their modus operandi is to move from constellation to constellation, colonizing, exploiting and assimilating the host consciousness into their agenda by creating synthetic realities with no regard for the natural order of life. It’s why the decisions and so called ‘leadership’ within society seems so crazy and out of kilter. They are, but we need to expand our consciousness into higher dimensions to really appreciate why. As with all similarly shocking situations you can look at what’s happening essentially in one of two ways: (1) with fear, panic and various levels of denial (2) you can confront your fears, process them out and allow infusing soul to inspire a higher way – one which can undoubtedly liberate you from this alien agenda. Naturally I am a proponent of the secondary approach! I urge you, take a deep breath and an even deeper look at the way we live. Is not practically every aspect as a cancer on the natural harmony of life that once existed on earth? With 400 nuclear power plants now on the planet, all at risk from similar events and if not solar storms, is that not the mirror Fukushima is showing to us all? So why not let it inspire you to throw off the vestiges of this worn out system of exploitation. Let’s leave behind the dehumanization that’s going on in every corner. Instead lets embrace the inner path to liberation and Ascension. One that leads to a new humanity in a new paradigm as the surface of the earth is cleansed in the Great Purification that has surely now begun. I can tell you, that in my knowing, it will take little more than a few human generations to cleanse the surface completely. Then will begin the reclamation and reconstitution by Gaia here, taking back that which was commandeered from her. And life for those who choose it, can begin again in the Fifth Density, the new paradigm. That’s how I feel to respond to such disasters which are surely now on the increase. I believe it’s the most positive way to look at them. To be motivated by real change. I observe they convince ever more people to let go. To empower themselves to be who they truly are. To find their true spiritually beyond merely an intellectual idea. The time has come to put spirituality into every-day practice, day by day, moment by moment. The time is now. There is no other time.